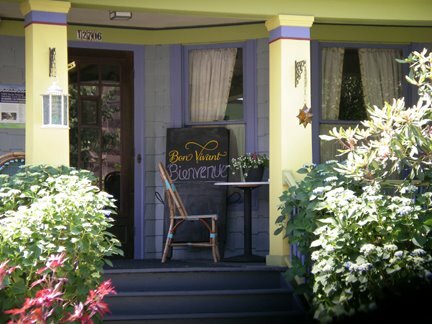 Bon Vivant opened in June 2012 in what was the old Vine and Bean restaurant. Their food is some of the best in Cleveland and they have multiple vegan options. The atmosphere is adorable because it is in an old house with beautiful woodwork and a nice warm fireplace. The people there are also very nice and it’s always a lovely experience. You should go there this week! I tried the appetizer of the Puy Lentils with fennel and tomatoes. Like the epitome of French cooking, it was simple ingredients just combined intelligently and cooked perfectly. I normally don’t like fennel but I wanted to try this and it was phenomenal. I mean really phenomenal like I’m wanting to go back soon just so I can have it again. It comes out in a small baking dish with a little lid and bread and vegetables on the side. For my entree, I got the special which was a vegetable patty made from artichokes, chickpeas, yellow squash, fennel, zucchini, carrots and flax seeds all ground together. It was really excellent as well. In the past I’ve also had the ratatouille and the mushroom strudel and the chocolate mousse (made with silken tofu). C’est magnifique!! I originally saw this post on Pinterest and made it myself but I put quite a few shortcuts in place so that I could make it start to finish in about 5 minutes. I can’t tell much of a difference between the full version and the shortcut, so as always, I’m going with the shortcut. The other thing I like about the shortcuts is that they make this an easy recipe to remember so you don’t even need to take the time to pull out your recipe binder. The way to make recipes fast is to do some prep work when you get home from the grocery store. I have lots of plastic containers (bpa free) in all different sizes so I can chop and have things ready. This is, of course, if I didn’t already get the pre-chopped veggies. For this recipe, that would actually only mean chopping red pepper. I also cook my own black beans because it is dramatically cheaper to do it that way. It’s not difficult, it’s just that it takes some planning. What I do is soak about 3 cups of dried beans overnight, and boil for an hour and then I put them in individual packages in the freezer and the fridge for later use. 3 cups dried makes 2-3 times as much cooked and it costs about $2 a pound (when dry). I feel very passionately about perfect avocados. 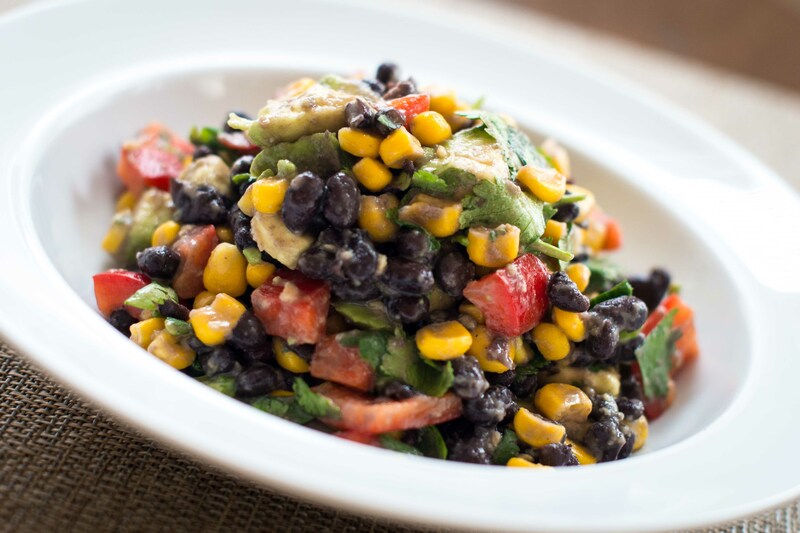 If you don’t yet have a perfectly ripe avocado, wait another day to make this recipe. As you’ll see in the picture, a perfectly ripe avocado will become somewhat like a dressing and coat the other ingredients. Mmmm… deliciousness. Chop everything that needs to be chopped. This recipe is so good you won’t believe how easy it is, and if you’re anything like me, you’ll start making it once a week and taking the leftovers to work for lunch. 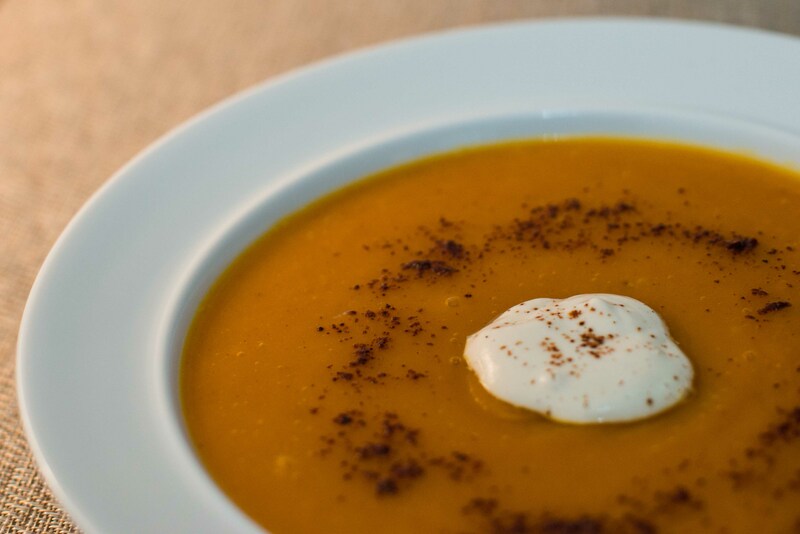 The spices blend so well with the pumpkin, that it gives the soup a warm, rich flavor without added cream or oil. If there was ever a recipe that tasted cozy, this is it. Canned pumpkin can be hard to find when it’s not Thanksgiving so I buy mine on Amazon since I use so much of it for this soup and for these fabulous pumpkin muffins. It comes out to very little money per can so I recommend just going for it and getting the 12 pack. Spice Mixture – I recommend making this ahead and then having it on hand so you don’t have to get your spice jars and measuring spoons out every week. Trust me, you will use it. This is also great on roasted butternut squash and on sweet potatoes. Heat the macadamia oil in a large pot on medium-low heat and add the onions. Cover and cook for about 5 minutes. Add the canned pumpkin, the water, the bouillon cube and the first tablespoon of the spice mixture. You could mix the water and bouillon on the stovetop before this step, but that would add time and another step and more dishes and my favorite thing about this recipe is that it is FAST. Keep this on medium-heat for about 10 minutes to let all of the flavors get more delicious together and stir occasionally. Transfer to a food processor or a blender until you can no longer see the onions and pour back into the pot. Take a little taste and then add more spice mixture and salt as needed. I personally like a lot of spice, but this is where different people in your household can choose different amounts. This is also the time when you would stir in some soy creamer or cashew cream if you prefer a creamier soup. I think it’s great without it and it’s still just as filling. 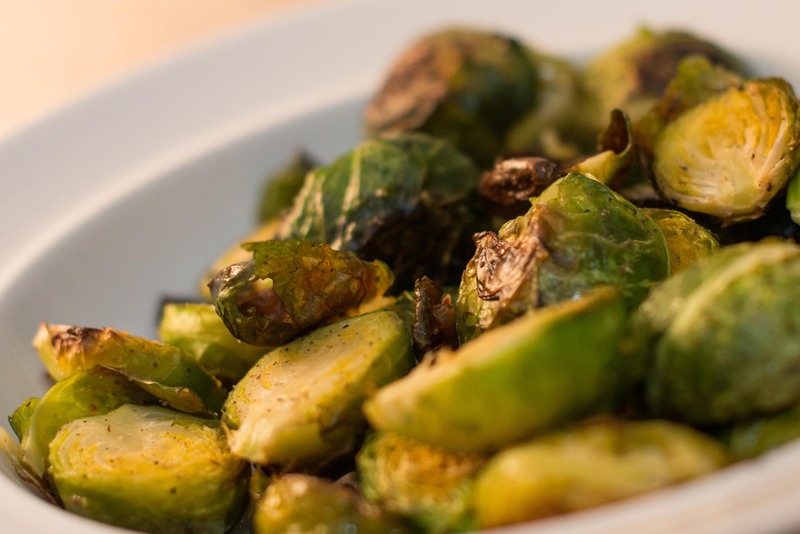 Roasting Brussels sprouts is so easy that I make them once a week. If you think you don’t like them then you’re probably not cooking them right. When you’re in the mood for a great vegetable side, you can prepare these in very little time and the best part is that they caramelize beautifully. An added benefit is that they are a cruciferous vegetable, so they have some of the highest cancer fighting properties of anything you can eat. I think these are particularly good when accompanying tomato soup. They’re also a really fun snack for movie night at home because the individual leaves that fall off are crunchy and salty and pure deliciousness. Cut off the bottom of each brussels sprout and then cut in half and place in a baking dish. I use a lasagna pan. If some leaves come off, make sure to still include them because those loose leaves are the best part. Splash a little bit of olive oil onto the veggies and put as much salt and pepper as you want. Mix with a spatula or do what I do and just toss them around with your hands. If you can’t see any oil, splash a little bit more and toss again. I honestly think that cashew cream vegan ice cream is richer and creamier than regular ice cream. This one in particular was just wonderful but I’ll include some more kinds of cashew ice cream as the weeks go on. Winter is no excuse to skip ice cream but I certainly am in the mood for different flavors in the winter. This one takes advantage of Ohio maple syrup that I got at the Shaker Square farmer’s market that runs all winter. 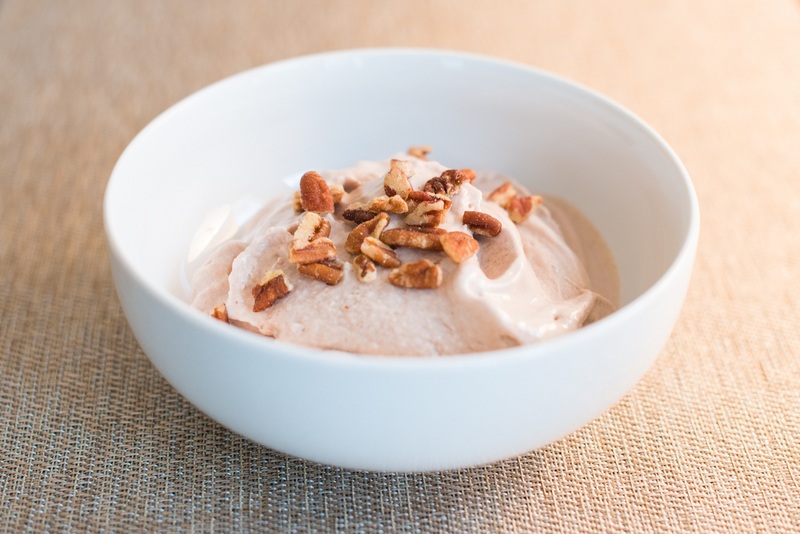 This maple pecan vegan ice cream has a fairly subtle flavor because there is no added refined sugar. This is for a whole bag. Go ahead, make 3 different kinds of ice cream this week! 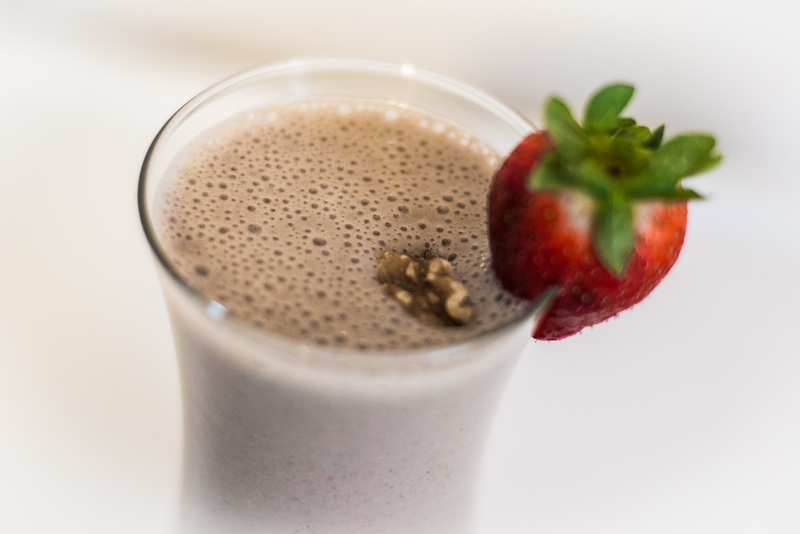 Soak raw cashews in filtered water for 3-4 hours. Drain the cashews and add them to the Vitamix or other blender. Add enough water to cover the top of the cashew line. Blend for about 60 seconds in a Vitamix or longer in any other blender. When it seems the consistency of very thick sour cream, you’re done. This means it should not be gritty AT ALL. Transfer to a large pot and simmer on low heat for only 10 minutes and stir almost the whole time. Put into the fridge to cool down unless you really trust your ice cream maker to cool it down super fast. When the cashews are ready, preheat the oven to 350 degrees. Put the pecans on a baking sheet in a single layer and cover with some maple syrup. Roast for just about 5-7 minutes. I actually put these in an oven safe non-stick pan (meaning non-teflon which is what Calphalon’s non-stick is) to make clean up easier. Add the cashew cream to the blender and then add the maple pecans after they have stopped bubbling. 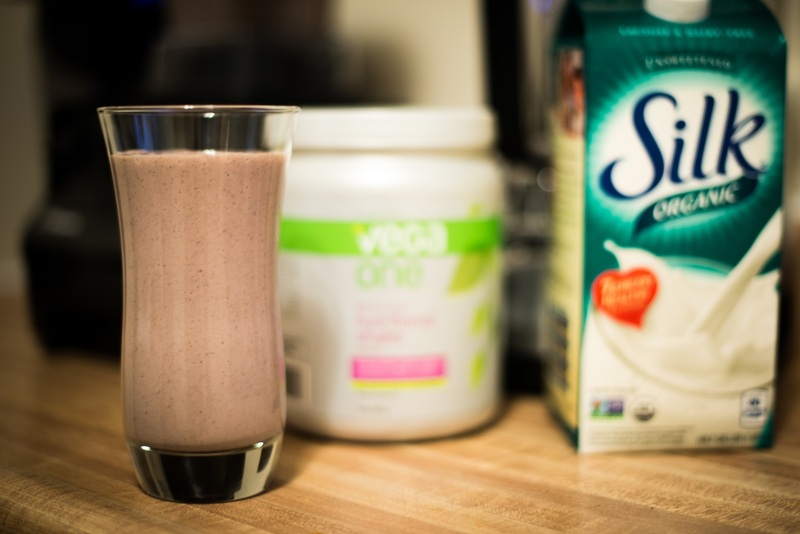 Blend on high for about a minute in a Vitamix or longer in a regular blender. Add the maple syrup and salt to the blender and blend for a few seconds or until it’s just combined. At this point you can put it straight into an ice cream maker or you may want to let it sit in the fridge for a little bit to cool down first. If you don’t have an ice cream maker, you can put it in the freezer for a few hours and then spoon it out into your blender to get a soft serve consistency. Scoop out and serve with pecans on top and collect the compliments from anyone that you may be sharing with! I updated this on 2/4/2013 because I tried the method of roasting the pecans along with the maple syrup and it was so good and made such a difference that I had to tell everyone. It’s also really important to let the cashew cream simmer for 10 minutes. When I made that change, it drastically changed the flavor. Let me know if you made any modifications, too or if you have tried any other flavors with the cashew cream base! It seems tempting to think that sweet potato fries are a better option when you get a bad french fry craving. Unfortunately, they’re still just as double-fried as regular white potato french fries. I wanted to try to make them at home without buying a bag of preservative and oil laden fries from the grocery store. As an experiment, I tried cutting some sweet potatoes into strips and baking them and it worked beautifully. This is still an indulgence, but if you’re going to indulge in fries, why not leave out the extra junk and get a nice healthy dose of Vitamins? 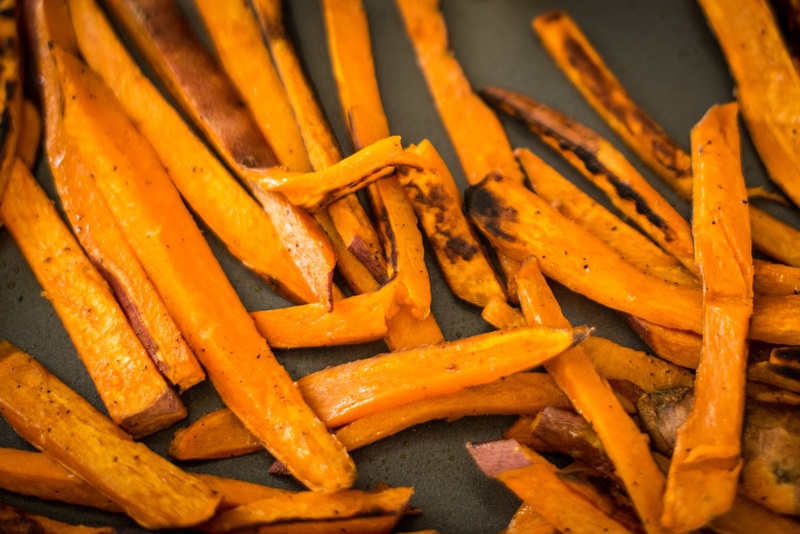 No preservatives in these easy sweet potato fries! Cut the sweet potatoes into fries, which will leave you with flat “chips” on the outside edges. You can either discard these or roast them along with the fries. Keep the skins on, because there are a lot of nutrients there. Toss fries with as little oil as possible on a cookie sheet. You basically have to use your hands to make sure you get the thinnest coat possible. Then sprinkle with salt and pepper. This is where you would add some chili powder or cayenne pepper or cinnamon if you want. Bake in the middle rack of the oven for about 40 minutes. Please keep in mind that ovens vary WILDLY so you’re in luck if you have a window in your oven to see when the edges start to brown. The best part is, that’s all there is to it!